In this Nova Build Guide, we provide an overview of his strengths, abilities, talents and matchups. 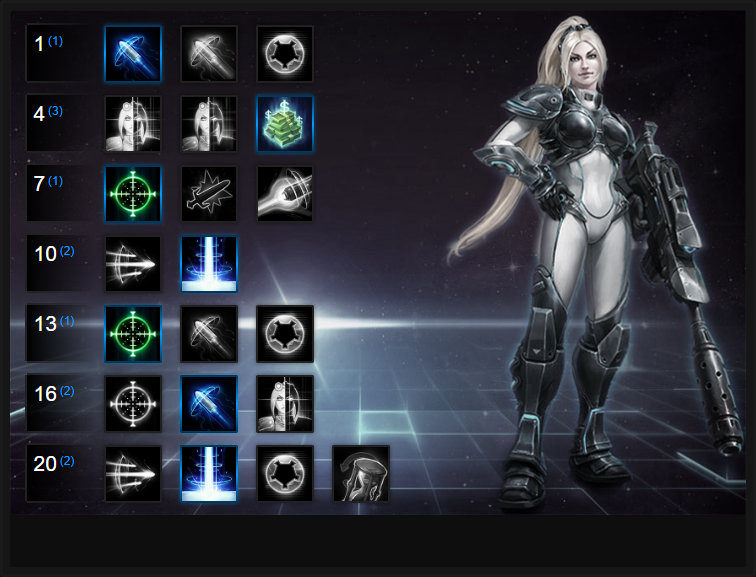 Nova is a ranged assassin and one of the few (alongside Zeratul) who remains almost permanently in Stealth. Unlike other Stealth Heroes, she can attack from afar and is capable of dealing huge spike damage. Her primary role is to roam across the map supporting lanes and team fights. Outside of her burst she is somewhat weak and if found unstealthed, she often easily focused. To play Nova effectively you need to be patient and often stand at the edge of a fight. It's not always wise to engage early and instead, it's best wait for a fight to playout so that you can then pick a low health, high value target. It's also worth noting that Nova is stronger in recent updates, but still falls-off massively at higher ranks. Ghost Protocal: Activate to instantly gain Stealth to Nova and spawn a Holo Decoy at her location. Nova is Unrevealable for the first 0.5 seconds when Stealthed by Ghost Protocol. Always try to remain stationary when near an objective before you burst, and remember that when Stealthed you're easily visible to eagle-eyed players. Unload your abilities, reposition and go back in. Ideally, also use bushes and vents to mask your location until Invisible. Finally, save Ghost Protocal for when under serious pressure to instantly gain immunity and Stealth. Snipe (Q) – This is your main source of burst, and an important ability to land consistently. Being in Stealth means it’s more difficult for your enemies to see it coming, so make sure to position correctly to hit your Snipe. If you miss, you’ll be lacking damage until the ability comes back off of cooldown. It's also incredibly not to miss simply because Snipe provides a stacking bonus, up to 5. At 5 stacks, your Snipe hits 25% harder: a significant boost to your opening burst. Pinning Shot (W) – In the quest to make sure that your Snipe lands, Pinning Shot can be undeniably helpful. Slowing down your target by 40% makes it easier to land a skill-shot, and the extra damage certainly doesn’t hurt either. Just be aware that Pinning Shot has a shorter range than Snipe by default, so be conscious of your surroundings before you decide to use it to lead your combo. Holo Decoy (E) – Due to having no mobility, effective use of Holo Decoy can be imperative to Nova’s survival. Since the decoy acts on its own, it can sometimes be difficult to trick people with it as it's fairly predictable. However, it can still do things like tank turret shots on a dive and create confusion when enemies have several different things to focus on. If you choose to take Talents for the Holo Decoy, it can become much more effective in the later stages of the game. Triple Tap (R) – Against an unorganized team, Triple Tap can be an absolute nightmare for your opponents to deal with. Its damage is high, and when lined up properly, can decimate a squishy enemy. However, opponents who are more aware will have their Warrior block the shots, making it much more difficult to hit your intended target. Precision Strike (R) – When used correctly, Precision Strike can actually deal more damage than Triple Tap, and hit multiple targets. However, due to the delay, many Heroes will simply be able to leave the area of effect. This Heroic is most effective when used as a follow-up to your teammates’ crowd control, making escape no longer an option. The global range on it also means you’ll be able to nuke your foes from anywhere on the map, so make sure to pay close attention to what your teammates are doing, as you may be able to win team fights for them even if you’re not in position. Long Shot allows Nova to fire Pinning Shot from a much greater distance (by 30%) but also increases her range from 6.5, to 8.5 units. It's a massive increase to her ranged potential and allows her to attack from much further back. Variable: Nova has very little crowd control and gains it all through talents. Covert Ops allows her to cause a heavy slow when she has used Pinning Shot, as long as she has remained stealthed for 5 seconds. Considering Snipe has a 6 second cooldown, you really should be making constant use of this talent as once you've used all your abilities you want to back away and re-enter Cloak. A slow of 55% is enormous and makes landing Snipe shots incredibly easy. Covert Mission is effectively Bribe, and allows Nova to acquire stacks to instantly convert Mercenaries. When she has, they'll also respawn 50% faster. For invading the enemy base and taking their camps, it's brilliant, while it also ensures Nova has a far wider use, as quicker Mercenary spawns significantly helps your team on Objectives. After Nova opens with her basic attack and Snipe, there's not much else she can do (besides try to use more basic attacks). Taking Perfect Shot allows Nova to reduce the cooldown of Snipe by 4 seconds when hitting a Hero, ensuring she can Snipe much more often. Variable: Although Anti-Armor Shells massively slows down your basic attack speed, it allows Nova to increase her basic attack damage by 250% while lowering the armor of her opponent by 10%. Combined with her Snipe (if fully stacked), she can deal massive burst damage. A large, global AOE that deals reasonable damage is excellent and Orbital Strike provides some much needed group wide pressure. If you can land it against a close knit group of players, it'll cause huge problems. If nothing else, it's great for preventing an objective interaction, or zoning the enemy. Psionic Efficiency allows Nova to increase the range of Snipe by 15%, but also sees you gain an extra stack of Precision Sniper. Great for quickly stacking damage. Variable: Having two slows from Double Tap is particularly useful because it means after your opening burst, you can then slow any enemies trying to attack you, or slow another for your next Snipe. It also means you get that touch of extra damage from having two Pinning Shots. The 20% vulnerability Crippling Shot causes against a target is immense, and allows Nova and her team to deal massive immediate damage to a single target. A fully stacked Snipe, immediately after Crippling Shot, can blow up most squishy Heroes instantly. Allowing Nova to gain a second charge of Precision Strike, Precision Barrage also lowers its cooldown by 30 seconds. For a close-quarter team fight, it's invaluable. This list of tips and tricks are just a handful of things we think will help your Nova play. We'll continue to add to the list as required and if you have any tips you'd like to share, let us know in the comments below and we'll place them here. 1. Try to use the long grass to hide your cover when firing, when not cloaked. You should also use these hidden locations to buy you time to re-cloak. 2. Always try to use your Crippling Shot followed by Snipe. You'll slow them, gain the damage modifier and find aiming easier. 3. You should only really use Snipe at maximum range when poking/harrassing an enemy or if your team is in front of you. 4. Your decoy is amazing skill for body blocking. As one example, used infront of Stitches Hook it will prevent you being snared. 5. You need to be patient with Nova to really play to her strengths. There's no use attacking if you'll fail to kill the target as you'll leave yourself massively exposed. 6. Always try to save your Bolt Of Storm for escaping. If you must use it to pursue a kill, make sure there is no one else around you so you can quickly re-cloak. 7. Learning each Battleground is important as there are lots of hidden areas or small nooks that you can hide in to avoid line of sight, even when not cloaked. 8. Always try to use Orbital Strike (if you take it) when enemies are stunned or body blocked to prevent them escaping its radius. 9. Always try to position yourself so that when you do fire, you can quickly escape. 10. Before using Crippling Shot or Snipe, summon your Decoy. Hopefully this will cause the opposition to use their cooldowns against it, which will buy you time if you are chased. 11. Don't worry if you die a lot as Nova - she takes a lot of practice but can be invaluable to a team. Hit Quick Match and learn her. 12. Always roam the Battleground. You can't clear lanes at speed, so you need to be moving across all three to pressure the opposing team and their Heroes. 13. Try not to move too much, as even when Stealthed you're still easily seen.